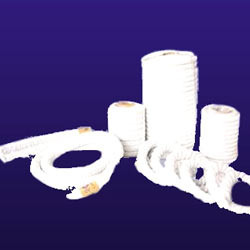 Ceramic Fiber Twisted Rope is a three-ply rope manufactured from Shree Ceramic long fibers. It contains 15-20% organic carrier fiber to facilitate the carding process. Ceramic Fiber Braided Rope is a dense resilient high temperature refractory with excellent thermal properties, chemical stability and high mechanical strength. Applications : Superior replacement to Asbestos packing, static/door seals in boilers, stoves, ovens, reformers, chemical/glass/coke furnaces, kiln cars seals, expansion joints in buildings & industries.